Centrally located in Zurich, this centre is close to the railway station and the major motorway junctions, and excellently served by public transport. This office will be available with modern furnishings, from 15m² to 50m². Offering an individual rental start with flexible terms.The services provided include telephone service, post service, secretarial work, furniture rental, discussion rooms, and meeting rooms (incl. catering service on request). In the underground garage there are adequate parking spaces which can be rented. 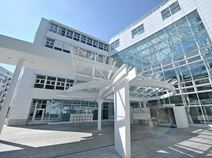 Centrally located in Zug, in an attractive and dynamic business location, this building offers modern offices with administrative/IT support, meeting rooms, and telecoms throughout the site for increased security. The building consists of a massive shopping centre and several facilities providing all the mundane services you could require. Within walking distance of the main railway station, these offices are excellently connected to the airport and to the main motorway junctions. Being only 40 minutes from Zurich Airport this business centre in Zug is ideal for the traveling professional with great access to both Zurich and Lucerne. Offering you fully furnished and equipped private offices, as well as shared space options. Due to its location it is ideal for financial and pharmaceutical companies. In addition, you will be in close proximity to many hotels where you can accommodate your visiting guests and clients. Located in a quiet, peaceful area of Zug, 200m from the lake and close to the train station, this business centre is on the 5th floor of the building and provides wonderful views of the mountains and aforementioned lake. There are many restaurants and shops in short walking distance, as well as hotels of excellent quality. These flexible plans provide tenants with administrative and IT support, conference facilities and meeting rooms. In addition, you can benefit from multilingual staff and an on-site management team who are happy to help keep your business running efficiently. Located in the heart of Zurich, this impressive building offers massive office spaces, fully furnished and equipped to a high standard, elegant reception area, spacious meeting rooms, the latest videoconferencing facilities and secure parking area. The building benefits from the central location and from the vicinity to the main railway station, which is within walking distance. There are also hotels within walking distance. This modern and contemporary business complex in the heart of the Crypt Valley in Zug offers a range of great work spaces for professionals. Here you can join the thriving crypto and blockchain community, meet like-minded entrepreneurs and share your ideas. With an international community, you can feel right at home. The centre hold regular social events and with a beautiful garden patio and event space with 150 persons capacity all are welcome. The building is right around the corner from Zug rail station. A selection of office spaces will be available for renting in the next few months in the centre of Zug. Furnished to a high standard and equipped with state-of-the-art technology, these offices offer ideal solutions for companies and entrepreneurs. They are available at flexible rental terms and benefit from parking facilities and attractive taxes. They are located in the vicinity of the railway station, close to the main motorway junctions and the airport and well served by numerous bus routes. This modern, chic flexible workspace is located in the heart of Zug within a gently curved building. The offices are fully equipped and are only two minutes walking distance to the train station as well as Lake Zug. Here, you will benefit from a prestigious address which will establish an impressive presence for your company. The surrounding area holds many other businesses with which you can network. 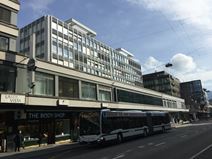 Occupying a strategic location in the city centre, this business centre boasts state-of-the-art elegance and enjoys excellent access to the motorway and social amenities. Here, there are copy and printing facilities, IT support, meeting rooms and conference facilities, shared internet and reception services. Your business can benefit from the space's comfortable working environment, which is accessible 24/7 for your convenience. Less than five minutes away from the space by foot, you can reach many attractions which you can visit outside of work. 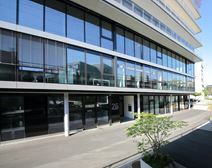 Located in the heart of Zug and well connected to Zurich airport, this prestigious building offers office spaces provided with a full range of high-standard services and facilities to support your business in daily tasks. These offices benefit from a professional working environment and from low taxation system in addition to support services that are provided by professional, multilingual experienced staff with secretarial support. Located in the historic post office building in the heart of Zug, this business centre has a modern interior with modern office solutions. It provides the perfect environment for entrepreneurs working in the blockchain and international trade sectors. You will not only benefit from fully flexible coworking spaces but also the community within the centre. The centre is within walking distance of the Ferry terminal and the Zugersee. The local area has plenty of amenities on offer including cafes, restaurants, bars, a movie theatre and grocery stores. A selection of office spaces is available to let at flexible rental terms to meet needs of any company. Equipped with advanced technology, they are provided with a large terrace and parking facilities. International companies surround this centre, which is easily reachable by public transport and close to the major motorway junctions. These advantages are sure to allow you and your business to grow.